What happens when the water in the pipes can’t be used to make coffee anymore? Next, rest easy knowing you have a backup plan and you have all the tools you need to stay open even if it may be with limited offerings. It seems like we are seeing more and more of these types of water situations. Whether it is aging infrastructure or the availability of more sophisticated water testing, toxins, natural disasters or problems with infrastructure are causing cities and municipal utilities to call for boil orders or to stop using the water all together. Consequently, café owners and technicians are having to get creative to continue to do business. It’s important to note that not all water issues are the same. In one instance in Salem, Oregon, the municipality was using surface water from a lake that – due to warm temperatures – had a cyanobacteria (blue algae) bloom occur that caused cyanotoxins in the water. Cyanotoxins can cause varying degrees of illness in people and animals and cannot be boiled out. Since the toxin levels were varying from one day to the next and boiling was not an option, the local municipality enacted a warning for the young and very old. Because the algae bloom is naturally-occurring and in the surface water that Salem used for drinking, there was not much the city could do to mitigate the toxins in the water. The city monitored the water and let the community know as the levels went up or down. This can be very frustrating for a responsible business owner that uses water as an ingredient for their product. Local water municipalities can institute a boil order when they cannot confirm that they are able to treat the water to the standard set by the EPA. This is usually caused by a natural disaster such as a hurricane or flood. In these cases, the water utility will say that water is safe to drink if it is brought to a roaring boil for 2 to 3 minutes. Sometimes, in more rural systems, mechanical breakdowns cause the city or town to issue a boil order while they get systems repaired. It is not always clear if there is anything bad in the water during these boil orders, but the city is asking people to boil water because they can not be sure that they are able to treat the water to EPA standards. In the case of the recent Austin, Texas boil order, the Austin water utility was inundated with massive amounts of silt in the water. Because Austin uses surface water and there was a 100-year flood upstream all the dirt, debris and silt washed down stream and the water utility was not able to keep the systems running because the silt clogged up the filters. Austin was not flooded in this case but was not able to deal with the problems created upstream. The Austin boil order lasted a week. Austin and Salem are just two examples of what seems to be a more frequent occurrence due to natural disasters. Man-made pollution and aging pipes are affecting water supplies, ultimately, we as technicians and business owners should have a plan for what to do when this happens. If we wait until it is happening, it may be too late act. Bottled water will be bought up at local stores fast and securing bottle pumps for equipment will be difficult because everyone else affected will have the same idea. I would recommend that coffee shops purchase one or two bottled water pumps to have just in case. Ideally you would want to purchase a pump for the espresso machine(s) and one for the coffee brewer. One pump could run both machines, but brewers and espresso machines are often not on the same counter. 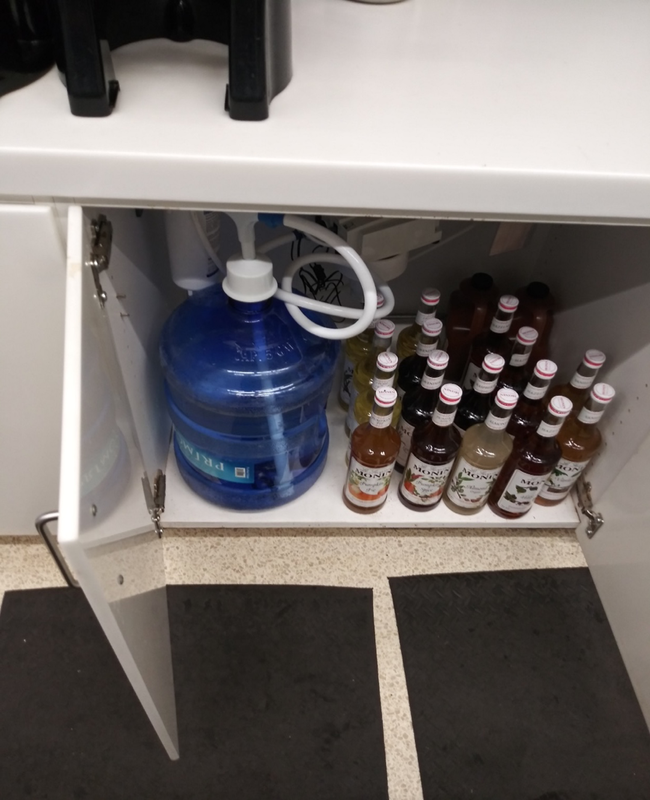 Having two pumps would not only allow you to reduce the amount of plumbing involved to hook up the coffee equipment, but you will have two bottles of water two draw from which will mean less bottle swap. Since water is hard to come by in these situations, it might be worth considering dropping drip coffee and only serving espresso. Beth Beall at Texas Coffee Traders in Austin told me that the grocery stores were out of water in less than 24 hours. In some cases, you can contract from a water supplier to deliver water to you during this time, but because everyone around you will have the same idea, the local providers might have a hard time servicing you. Getting water from somewhere outside of the boil order is also an option but could mean driving 50 to 100 miles. Eugene Thoms from Texas Coffee Techs was able to filter and fill a 300-gallon water container at his ranch to help support their customers. They filtered the water going into the sanitized water container and double-filtered it back into five-gallon containers for distribution. This created a full-time job filling containers. It’s not hard to calculate your average daily water usage based on sales if you dig in to the data, so you should be able to get enough water to last a few days if you have room to store it. If you can boil water at your location, then you are in good shape, but you will need a lot of extra labor. Count on a few extra people to boil and refill jugs when refilling your bottles make sure the water cools down before using it with the bottle pump. In Austin, we saw shops using propane and turkey frying setups to boil large amounts of water. Another solution for local businesses in Austin that could not boil their own water was to partner with local breweries because they can boil large amounts of water when they are not making beer. Keep one set of extra filters for your filtration system. Once the boil order is lifted, you will want to change all the filters that has the bad water left in it. If you can, schedule some time with your local coffee technician before an event like this to show you how to hook up the bottle pump and change the water filters. If you don’t know how to do this yourself, be in close contact with your coffee technician – during a boil order they will be very busy trying to get everyone up in running all at the same time. Tech companies should stock extra bottle pumps and filters for these types of emergencies. Connect with peers through the CTG – having extra resources to get filters and pumps quickly in these situations will be helpful. Reactive calls to help customers install pumps and get will increase dramatically during the boil order. Work will only increase when the boil order is lifted as customers will want filters changed and pumps removed to reconnect to plumbed water. There is also potential for equipment repairs on machines that have been turned off for a while. These machines will likely have new problems as they get started back up. Gaskets and seals that have contracted and expanded that were ready to fail will fail. Debris from the water lines will make its way into the equipment hydraulic system, either holding valves open or clogging up small orifices. Once you know that a boil order has been declared, plan with your customers to get in and change filters, flush lines, and calibrate equipment. It will be better to have communication up front and to keep expectations clear. If timelines change, let them know. It is always better to give bad news rather than to go radio silent. Be clear what the costs will be. Customers know that they will have to pay for service, but upfront communication and estimates of service will save lots of headaches once techs are on site. Remember that during this boil order your customer is possibly not generating revenue, making for a tough time to spend money on repairs. Getting your coffee brewing is only a small part of the complication during a boil order. The local health department will also have some guidelines to follow. In most cases, washing hands and dishes will also require bottled water. Hand washing is easy. You can use a Cambro or any food grade container with a lever faucet and most of the time the health department will allow you to wash hands with cold water as long as hand sanitizer is used. Dishes can be a little tricky because health department still wants the dish washing water to be at 150-160 degrees Fahrenheit. This might be a good opportunity to use the coffee brewer. Limit all dishes to small wares and make everything else “to-go”. Use a festival setup where you use containers like bus tubs or even better 6” steam table pan. Whatever you use will need to allow the biggest item to be submerged. Make sure and touch base with your local health department because in these difficult times they will sometimes allow exceptions. To paraphrase Maya Angelo, prepare for the worst, hope for the best, and you won’t be surprised by anything.